What does it mean to "Pawn" an item? What does it mean to “Pawn” an item? It is a direct personal loan made with collateral. Unlike banks, where when you request a loan they base their decision on a number of factors including employment history, income, assets held and credit, Pawn Brokers use a much easier system. It is based on whatever item you currently own and are willing to place on a physical hold with them for the time frame of which the loan is outstanding. During that time, interest accrues on the loan and is paid to the broker. These loans are not intended as long term financial fixes but can be a fantastic option when you need short term cash in the interim. When managed correctly they can be a tremendous financial asset to have at your disposal. This number depends completely on the current fair market value of the items you have to pawn. The better condition your items are in (complete with no missing parts, scratches, dings, dents, wear and tear and so on) the higher the determined loan value will be. The market value can be accurately determined by a combination of personal acquired knowledge and online listings of the same or similar item. What kind of items can you pawn? Now that would be a never ending list if we attempted to include everything we have accepted over the years! Video, Audio, Musical Equipment, Instruments, Smart Phones, Tablets, Motorcycles, Cars, Bikes, Jewelry, Diamonds, Watches, 3D printers, Firearms, Gun safes, Power tools, Video Games, DVD’s, Computers, Memorabilia, Collectibles, Antiques, Landscaping Equipment, Slot Machines, Furniture, Sports Gear, Rare Coins, Gold Coins, Collectible Foreign Currency, Collectible Signs, even taxadermied wall mounted animal heads. If you have it, we just might take it. How long do you have to pay the loan back? Subject to individual state laws, a typical pawn loan may have a term length of 30 days plus a 30 day grace period. If you cannot pay back your pawn loan in full, including any applicable grace period, extensions/renewals (where permitted by state law) are permitted to give you extra time which can be extended out for as long as you need it, even up to 12 months or more. You may also choose to surrender your collateral (pawned item) as payment in full at any time. 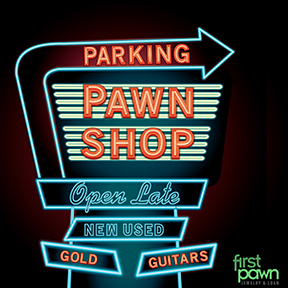 Pawn shops main goal on a loan is to generate income based on the interest, not to procure your items. They are happy to work with you as much as possible to make your pawn loan a mutually beneficial transaction. When you are ready to end the loan and take your property back, you simply need to pay back the principle of the loan as well as any remaining past due interest. At that time, you will be given back your merchandise in the same condition that you pawned it in. At First Pawn Jewelry and Loan we take pride in our business and treat your belongings as if they were our own – with respect and care.